Extremely tasty, gluten-free dog food. 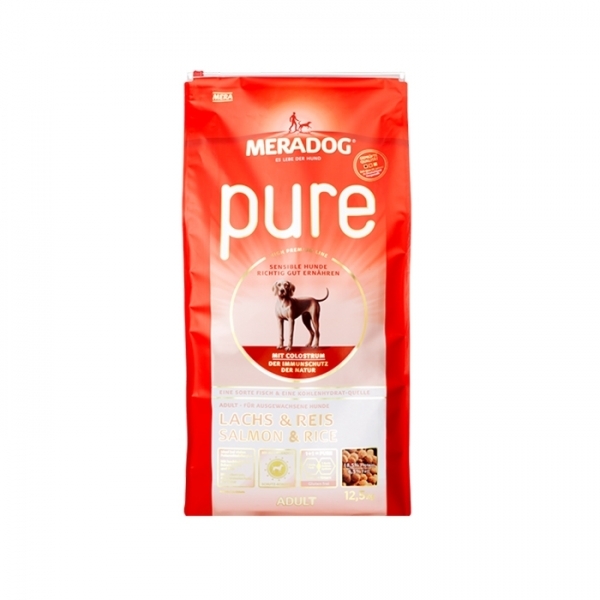 For fully-grown dogs with special requirements, nutritional problems, intolerances or allergies. The scientifically solid, uniform nutritional system for the healthy and happy life of your dog. Tailored to the individual needs of your dog, this protective concept creates 360 degrees of total satisfaction. Antioxidants (vitamin C, E, beta-carotene and selenium) for optimum cellular protection. 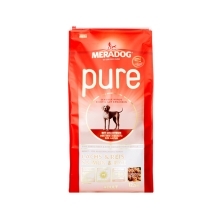 Meradog products are generally fed dry. Make sure that your dog has a constant supply of fresh water. The recommended details are only approximate values per day and must be adapted to suit outside influences and the dog‘s dispositions. Please store all Meradog products in cool and dry place so that the quality of our products is maintained over the entire shelf life..
Rice (66 %), salmon flour (13 %), dried sugar beet pulp (desugared), brewer's yeast (dried), animal protein (hydrolized), linseed (2 %), salmon oil (1,3 %), calcium carbonate, monocalcium phosphate, sunflower oil (0,9 %), cellulose fibres, bovine colostrum ( = 0,5 %, rich in immunoglobulins), yeast extract (dried = 0,2 % beta-glucans and mannan-oligosaccharides), sodium chloride, chicoree powder ( = 0,1 % inuline), seaweeds (dried).